Do you love chocolate and coconut? Do you like baking treats for breakfast on weekends? If yes, do I have a recipe for you. These donuts are fantastic. I found them on another blog a few weeks ago and baked them using a donut pan that my boyfriend recently bought for me. I love baked donuts! They’re so easy to make and they’re like donut-shaped cakes. I had a substantial amount of leftover frosting, the next time I make these I would probably half the frosting recipe. I searched high and low for the coconut extract and ended up finding some in Fairway. Lightly grease a donut pan; set aside. Spoon mixture into prepared doughnut pan, and bake for 10-11 minutes, or until the doughnuts spring back when lightly pressed. Be careful not to over bake here! Allow doughnuts to cool a few minutes in the pan before transferring to a doughnut pan to cool completely. In the bowl of a stand-mixer fitted with the paddle attachment, or in a large bowl using an electric handheld mixer, beat the cream cheese, butter, vanilla and coconut extracts on medium-high speed until completely smooth; about 2 minutes. Reduce the speed to low and gradually add the sifted confectioners’ sugar. Add in the coconut milk. Once the milk is combined beat frosting on high-speed for 1-2 minutes. Preheat the oven to 350 degrees. Spread coconut out in a single layer on a small baking sheet. Bake for 4-5 minutes, or until lightly golden brown. Cool before using. 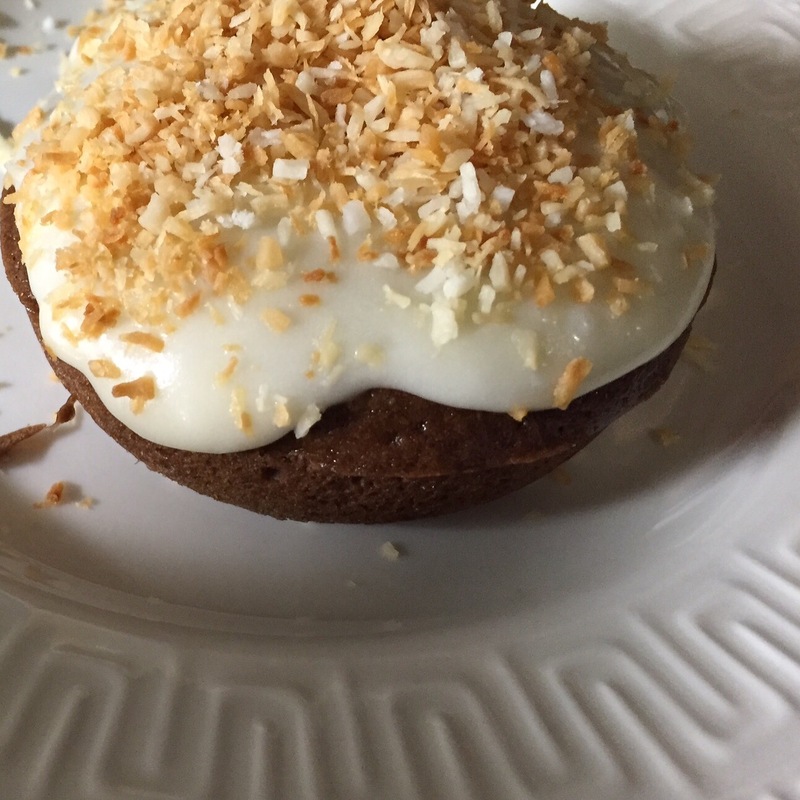 Spread the frosting on top of each cooled donut then sprinkle with a few teaspoons of toasted coconut. Serve at once!